I got this bottle as a birthday gift. It’s from Phillip Island – I didn’t even know they made wine there! I like the label. 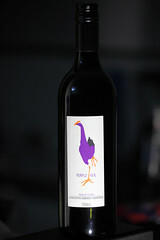 It reminds me of a purple swamphen – in fact looking at it now, I’m pretty sure that’s exactly what it’s meant to be. Anyway, there was no difficulty in picking the dominant aroma with this one. One big sniff and my wife immediately declared “blackcurrant!” It was like taking a big whiff of Ribena. After a bit more analysis and thought, I also came up with cut grass, which my wife gave a thoughtful nod to. In the mouth, the first thing that hits you is the oak. I’m not a big fan of oak, and this was pretty strong. Then there was the inevitable fruity flavour, with perhaps a hint of smokiness. And bringing up the rear a slight tang of herbs. I’ve had a Cabernet or two before, but this one was beefy and powerful, a bit too strong and “raw” for my taste. At this point I really don’t know exactly how aging changes the character of a wine, but I get the impression that it can take the hard edge off the strong flavours and give a more rounded mellowness to the result. I think that’s what this needed. Not bad… just a bit too strong, particularly the oak. During the night after drinking this, I had a strange dream, in which I was examining the bottle, and noticed that it had come in a champagne closure (in reality it was a screwcap), and the bottle bore signs of having been previously used. Removing the Purple Hen label revealed that it was an old Bollinger champagne bottle, apparently recycled. I have no idea what that means, except that I have strange dreams sometimes!